Translated by Suzanna Maria Emmanuel Thought Consciousness Cycle, how it creates and how it will evolve. Namaste, I send much love and light to you. Here we see how we constantly create energy and for many thousands and thousands of years we, as a race, became involved in the anger game, constantly going around in circles, not knowing how to end it. Here is a beautiful image of two sharks, wanting to eat each other constantly. This image is showing us how we need to come back to the love balance collectively for we are out of balance energetically and constantly we create more pain for ourselves and for each other. Who are the sharks? Who are being eaten? What is the cycle creating, for more viciousness is being created constantly in this image. How can we create love and peace upon our plane if we continue on the path of anger? The sharks are in the anger, wanting to eat others and cause much pain to others. An interesting point here that you might like to know, when we become angry, our whole energetic self begins to suffer and we cannot ever be in our full potential as we become energetically depleted. When others show anger towards us and we are in the forgiveness and in the love, they, the angry ones, freely give their power to us, because this is how energy works. When we stand in our love and forgiveness, we can claim the energy back that they, the angry ones are trying to take from us. Instead of being able to take our energy away from us, in their anger they give us their energy. We can also claim back energy they have taken from us in the past. Only however, if we stand in the love and the forgiveness, for love is always more powerful than anger. Then, once we have claimed it back it is up to us to discover what to do with that power. We can use that power to create more anger or more love and harmony in our lives. This is why it is absolutely crucial to always be in the love and in the forgiveness, to gain deeper strength within us and to heal deep within us. For many thousands and thousands of years we have not understood why our earth plane had such pain and suffering and now we are in the times of Enlightening and Awakening, where we can understand more of the game and how we can change all things back to the love frequencies. However, it all begins with understanding what we have been creating as people and how we have been feeding other planes too, as a collective, who were growing more and more as our pain and fear grew more and more. They placed those thought patterns within us and because we became part of that vicious circle we, collectively, began to live them, to act them out, because we became part of their own programming. Now we must change in order to change the cycle. The sharks represent human anger consciousness, not understanding how to stop the cycle of pain and anger. In the centre of the circle shows the energy rotator. The brown propellers bring the energy created from the anger and suffering in to create more energy to put back into the cycle. The whole circle shows the machine we have created, creating energy from the lower frequencies of pain, which is ours. This cannot stop until we begin to awaken and begin to love ourselves and each other once more. The light within the frequencies shows the energy created. We can create it for more pain and anger, or to become more love. It really is our own choice as we have the choice as to what to create upon our plane collectively. The fins show the machine of energy creation. The rotation of the circle needs to slow down with love frequencies to help people embrace living upon our earth. The more anger the machine produces the faster it rotates. It is all about finding the greater balance. The lower frequencies of the denser planes have been feeding from the anger machine we have created to create their strength and power as they harmonize with our anger and fear energies. The more they receive these energies, the more they can send the same energies to us to create more anger. However, now with the awakening happening, the energies are beginning to become lighter upon our plane. The more the people come into the love energies, the greater the anger energies will stop cycling until we have found a beautiful cycle of balance. What we must ultimately understand is that when we become at peace we are working towards transforming our consciousness as mankind. One person affects another and another affects another. By teaching others how to come into the love, and by turning to love, we are creating higher patterns upon our plane. Always stay in the love and in the forgiveness, and turn to greater love. We must awaken. * The pinkish shading – our lower thoughts and energy cycles. It is the energy that’s created by the anger and the pain, constantly feeding back into the sharks to become more aggressive in our lives. * The blue – our limited thought patterns, split into three sections to show our greater separation of ourselves, for we are truly not even these thoughts but we are high beings of great love, stuck in this spinning cycle until we awaken to the love within us. * Here the sharks are wanting to eating the next sharks, first thinking it is a small fish and it doesn’t matter, but not understanding that the energy it affects is not small, but large. The sharks are blind to the greatness of it and thus keep going after the little fish, which is a symbol for our lives when we don’t understand how great our importance is. 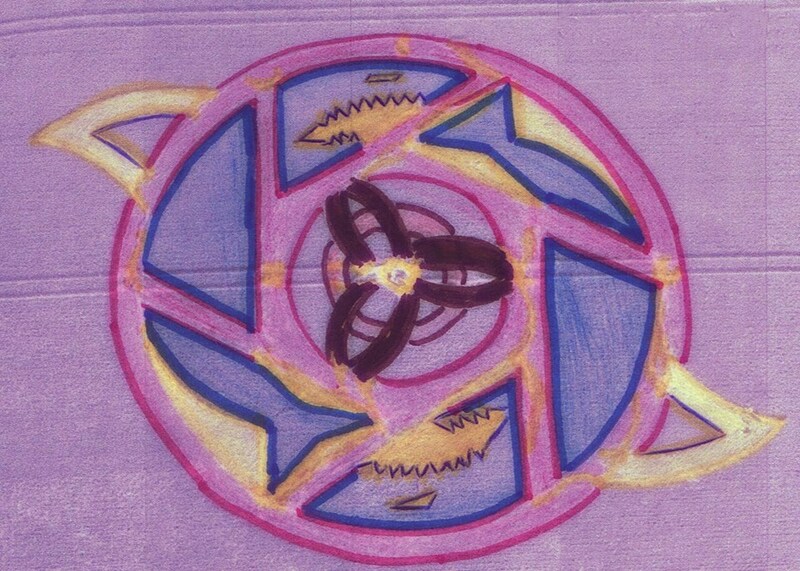 * The rotator in the centre brings energies we create back into the cycle, and then places it back into the pinkish to create more of the anger energies. * The yellow shows the electricity generated by the anger consciousness machine. This energy can either be used for creating love and light upon our plane or more of the same anger and pain. We have the power to change all things collectively.